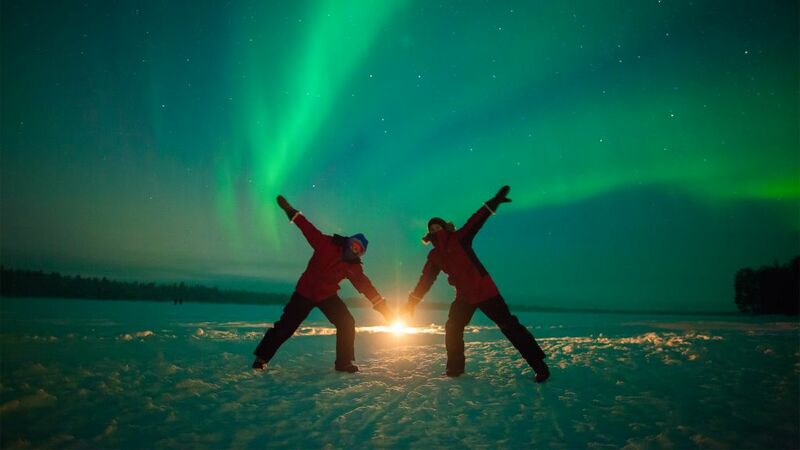 Seeing the Northern Lights in person is a dream shared by many. The chance of capturing them on your camera makes the hunt even more exciting! There are lots of different factors in play in aurora photography. Study this list and prepare yourself, so you can drop some jaws when your friends start calling out “pics or it didn’t happen!” This checklist is written with the digital photographer in mind and broken down into four parts: gear, composition, execution and post processing. None of these should be neglected if you want to produce the best images possible. If you wish to capture the Northern Lights in all their glory, you should first look for a camera that performs well in low light situations, shoots raw files, has manual controls and can fit a bright, wide angle lens. Full frame pro-grade cameras such as Nikon D5, Sony A7SII or Canon 5D Mark IV are all very popular choices. The Sony can even record very usable real-time video of the auroras, an impossible feat only a few years ago. A system camera with a large sensor is the best option because it can gather a lot of light. Generally speaking, the bigger the actual photosites in the image sensor are, the more accurate the information in your image file will be. For example the Sony A7S uses a 36mm x 24mm full-frame sensor that only has 12 megapixels. Many smartphones have 12 megapixels or even more, but the sensor area – and single photosites – can be 50 times smaller than of the A7S. That means they will collect only a fraction of the light. This is the reason why smartphones struggle with low light scenes. Even though you can take some sort of a photo of very bright auroras with a smartphone, the image quality will still be quite poor. In practice, bigger isn’t always better. The super- expensive medium format digital cameras with huge sensors will struggle in low light, as their sensors are primarily built for different purposes. Recent camera models with smaller APS or 4/3 sized sensors perform reasonably well in low light too, and might make a more convenient and affordable setup. Still, for absolute image quality in low light scenes, full frame is the way to go. Remember to load your camera batteries before any aurora mission and keep some extra batteries in the warmth of your pocket. Before rushing to buy a new camera, you should consider the available lenses for each system. If you own a camera you are otherwise satisfied with, you should make fast, quality lenses your priority. Good lenses have a long lifespan. People still use quality glass dating back several decades. The same can’t be said of digital camera bodies. 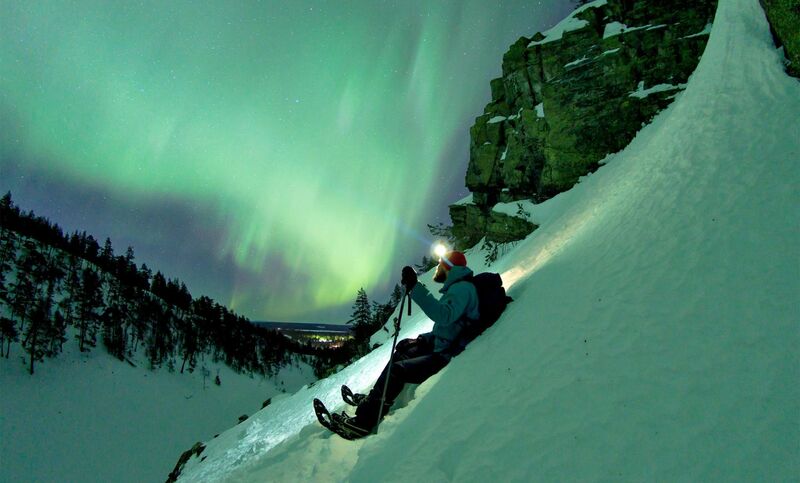 Auroras often fill the whole sky, so you will need wide lenses. A bright, moderate wide lens with a 24 mm focal length is a good option to have, with an angle of view of 84 degrees on a full frame camera. A full frame fisheye lens with a 16mm focal length has a 180 degree angle of view. With a fisheye, you can fit almost the whole sky in your image! Picking the right focal length is a matter of taste and the shooting scenario. A fisheye will give you strong barrel distortion, while a regular ultra-wide lens comes with strong perspective distortion. Nearby linear objects such as trees will look distorted, especially when you tilt the lens upwards to the sky. However, distortion can be adjusted in post production to some degree. Naturally, you can choose to shoot Northern Lights with a longer lens, such as even a 50 mm, but you will get just a portion of the sky in your frame. In optics, aperture stands for the hole through which the light travels. The bigger the aperture, the more light the lens can let through on the sensor. An aurora photographer will benefit very much from lenses with a large maximum apertures. The drawback is, they are also way more expensive. A fast 50mm/f1.8 lens can be bought for under 200 € for pretty much every system, but the few f1.8 ultra-wide lenses available can cost almost ten times as much. The lens aperture is specified by the f-number. You should note that the smaller the number, the bigger the aperture and thus “faster” the lens. The numbers follow an approximate geometric sequence of 1, 1.4, 2, 2.8, 4, 5.6, 8, 16, 22 etc. When you open up the aperture one full “stop” – going from f2.8 to f2 for example – the aperture area doubles, meaning you can use half the exposure time. This means that f4 is 4 times slower than f2 and 8 times slower than a f1.4. In aurora photography, this makes a huge difference! In practice, a faster lens will allow you to use a shorter exposure time or a lower ISO setting. This means that you can freeze the motion of auroras better and have cleaner image files with better colors, less noise and sharper details. No wonder serious night photographers also put down serious cash for bright lenses. They want all of the available light to hit the sensor. When shooting in the night, you will definitely need a sturdy tripod to hold the camera firmly in place during long exposures. Make sure you set up the tripod securely, and tighten all locks before shooting. Sometimes you might want to illuminate a feature in the landscape. The lo-fi, run & gun way is to use a flashlight or a headlamp to “paint” some light by hand on a subject during exposure. The problem is that, it’s hard to apply the right amount of light evenly with the narrow beam of a flashlight. Night photography specialists often use dimmable light panels instead. Aurora photography is a lot like shooting landscapes in the day. You just use longer exposure times. You should train yourself on night photography first, to make sure you can handle the basics before taking on the Northern Lights. If there is no luck with auroras, you can always try honing your skills on astrophotography. Capturing the Milky Way in Lapland is surprisingly hard, because the auroras often dominate the sky when it’s clear and dark. A great aurora photo has more going for it than just the Northern Lights. You should look for interesting features in the landscape to complete your composition. Try to capture the snow giants, dead standing tree trunks, ice falls, interesting architecture or even people in your photos. Just make sure your subjects can stay still during the exposure! You can approach the auroras in a similar fashion to clouds in landscape photos. Do you want to make the clouds the only subject, or are they features that complete the composition? Pick a good aurora spot with interesting features to play with, try original ideas and think about the story you want to tell with your images. It’s always better to be all set up at the location before the show starts, with different compositions thought out beforehand. Auroras can appear quickly. You don’t want to be running around in panic looking for gear or an angle when lights are already dancing above you! Camera settings for Northern Lights photos are specific for each situation and combination of camera gear. You should get to know your camera and its limits to make the right decisions on the spot. It’s recommended to shoot raw files instead of jpeg, because they contain more information and are much more flexible in post processing. When you shoot raw, the aim is to 1) freeze the motion and details of the aurora, 2) while getting a good level of exposure, 3) without clipping the highlights in the aurora. You will mostly adjust ISO and exposure time to achieve this. Pick a fast wide lens and always use maximum aperture. Unscrew all your lens filters for aurora photography, as they might block light or introduce unwanted artefacts. You can shoot in full manual mode and adjust all the settings by hand. An easier option is to use aperture mode and adjust the exposure value manually while letting the camera decide the shutter speed. This can be very useful if the light is rapidly changing. White balance can be set manually around 3700 kelvins, which usually works well for night time photos. ISO setting adjusts the sensitivity of the sensor to light. The base ISO is usually 100 or 200. When the ISO number doubles, the sensitivity doubles. This means you need only half the time to achieve the same level of exposure. If you need 60 seconds with ISO 200, you can use 15 seconds with ISO 800 and 3,2 seconds with ISO 3200. Usually the base ISO is way too slow for aurora photography. You should start around ISO 1600, which most modern cameras can handle with ease. With pro-grade low light gear you can go much higher if needed. There is a caveat. Higher ISO also comes with a drop in image quality: more noise and less detail in underexposed areas. The aim is to freeze the motion of the aurora while getting a good level of exposure in the frame, while also avoiding severe over exposure. If the auroras are moving rapidly, you might want to increase the ISO to 3200 or even higher to utilize a shorter exposure time and avoid getting mushy, blurry auroras. Don’t try to use a lower ISO and underexpose, because then you will have to add exposure in post production. Severe underexposure is one of the biggest technical mistakes you can make besides misfocusing. You can add exposure in post, but will actually end up with more noisy images than you would have with a higher ISO and proper exposure. Minor overexposure can be easily corrected from a raw file with absolutely no harm done. But, if you get areas that are completely blown out white, there’s nothing you can do in post production to save them. If you have a strong source of light, such as a cabin window or a bonfire in the frame, you can combine two or three different exposures in post to avoid blown out areas. The last of the “three pillars” of photography besides aperture and ISO is the shutter speed, in other words, exposure time. Unless you are using crazy high ISO on a pro grade camera, you are going to need several seconds for proper exposure. Say, you have a f2.8 wide-angle lens on and ISO set on 1600. You could start with 10 to 15 seconds of exposure, quickly check out the preview and if the image is too dark, increase either ISO or exposure time. If you are risking serious overexposure, decrease exposure time first, keeping the ISO up. If the Northern Lights seem blurry because of motion, you should go for a shorter exposure time and compensate with a higher ISO if needed. With very intense auroras and a bright lens, you can use relatively short exposure times of under 2 seconds and with faint ones you sometimes need even 30 seconds. If you go even longer, you will start to see star trails because of the earth’s rotation. When photographing auroras, you usually focus your lens to infinity. Focusing in the dark can be a bit difficult. You can use a flashlight to illuminate a tree a bit further away or use the moon as your focus aid. No need to refocus between every frame. Do it once and don’t touch it unless you have to recompose. Of course, you might sometimes want to focus on a subject in the foreground for creative reasons, leaving the background and the auroras a little soft. You should use either a timer, a remote or interval shooting mode with a tripod to avoid camera shake. Let the camera remain completely still until the exposure is over. If you want to get photos of Northern Lights but don’t want to spend all the time focused on operating the camera, you could just leave the camera on interval shooting mode and go enjoy yourself while the camera is recording frames. This way you could even compose a timelapse film afterwards. Thankfully, the latest digital cameras produce very flexible raw files. Aurora shots can always benefit from a little fine tuning. Unless you have a completely underexposed, burned out or misfocused image, you can work wonders with an editing software such as Adobe Lightroom. Remember that long exposure photos present the Northern Lights more vibrantly compared to how people see them with bare eyes. Us humans can’t see color too well in low light. When you start asking yourself if the image looks “too edited”, it probably is. You can go overboard with Photoshop and filters all too easily. However, everybody has the right to make images to their own taste. Here are a just a few pointers you can use to enhance your pics. Post processing aurora photos is no different from other types of digital photography, but because of higher ISOs and dark areas, noise is usually a big factor in many images. When working with raw files, you should always at least sharpen the image and adjust the contrast for the final output. Correct the general exposure level if needed. You can also use masking or gradients to adjust exposure in different areas. You can try adding some micro contrast by using clarity, but this method can make areas with noise look worse. You can avoid this problem by adjusting just certain areas by masking them first, and then adding some clarity. You can also adjust certain color channels or use brushes on the sky to make the auroras pop out a little bit more if you wish. In .jpeg files, the noise is already reduced by software. With raw, you should adjust noise reduction manually. Avoid applying too much noise reduction. Excessive smoothing will give the images an unnatural, plastic look. Some fine grain is nothing to sneeze at. Use the sliders to work out the right amount by stopping below the level where you start losing details. You could also apply more noise reduction to certain problem areas with a mask tool. This way the noise reduction will not kill the details and structure in the whole picture. Check and correct the purple fringing around stars. If there are color dots or other artefacts that don’t belong in the picture, you can remove them with the spot tool. You could also add a gentle unsharp mask after the noise reduction process to make up for lost microcontrast. Once again, don’t overdo it. You can reduce editing time by saving your basic settings as a preset to apply on similar photos before working on them with more precision. When you are happy with a picture, why not share it with the world? 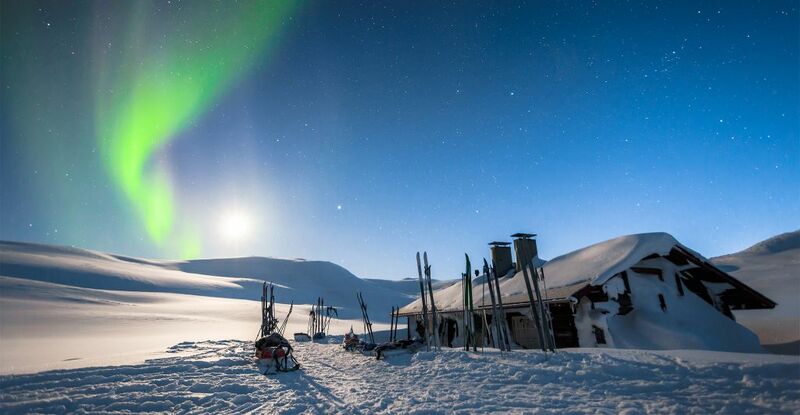 Tag your shots taken in Lapland with #laplandfinland and tagging @onlyinlapland. 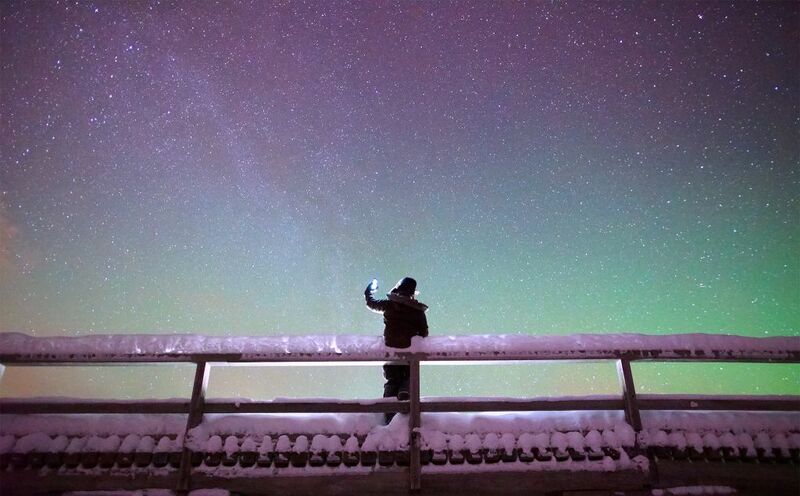 That way people can find your photos, and you can also discover inspiring images by other Lapland-loving users of Instagram, Twitter and Facebook!